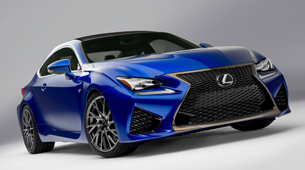 Lexus Australia has announced that the RC 350 coupe and the fire-breathing RC F performance coupe are due for launch by the end of 2014 or at the beginning of 2015. “RC and RC F arrive at a time when Lexus is preparing to celebrate a quarter of a century in Australia. These two new vehicles epitomise Lexus’ renewed focus on driving dynamics and design — while signalling a bolder, stronger, more confident Lexus,” said Lexus Australia Chief Executive Sean Hanley in a news release. The RC 350 will put power to the ground via the rear wheels and will feature an all-alloy direct and port-injected 3.5-litre V6 developing 234kW of power and 380Nm of torque. The eight-speed Sports Direct Shift (SPDS) transmission manages the power and improves accelerator-pedal operation. The RC F features a high rigidity body with larger cross-section rocker panels and a highly rigid front lower brace. The uniquely engineered and designed elements of the RC F confirm the vehicle is worthy of the “F” moniker, which is now recognised as “the pinnacle of Lexus performance”.